MICHIGAN TRUTH SQUAD ANALYSIS -- "Forward"
Questionable statement: "Michigan is falling behind in the clean energy race. Thirty other states have already passed measures similar to Proposal 3." "More than 30 states — including Illinois, Ohio and Iowa — already have adopted renewable energy standards similar to Michigan's proposal and are higher than Michigan's current standard of 10 percent." CARE, the opposition ballot group to Proposal 3, stated via a press release that "no other state has a similar measure" -- a statement tied to the matter of placement in the constitution. Crain’s, after learning from MTS that the statement was being used in an ad, added a clarification to its July 6 report. 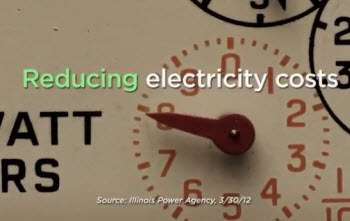 Questionable statement: "In Illinois, clean energy is creating jobs while reducing costs." An IPA report from April 1 does say that the renewable energy prices for customers of Illinois' two major utilities were on downward trends. And it states, "Renewable resources, in particular wind, have played a dramatic role in reducing electric energy prices in Illinois and the entire Eastern Interconnection, as measured by the impact on Locational Marginal Prices (LMPs)." On jobs, the report states, "The Illinois Power Agency has been presented with evidence that the Illinois Renewable Portfolio Standards (RPS) appear to have enabled significant job creation and economic development opportunities as well as environmental benefits." The report continues, however, that "Care must be taken, however, to not optimistically extrapolate these results without limit, as factors such as market prices for energy, transmission constraints, and uncertainty in the load serving responsibility will affect the cost-effectiveness of near term future additions to the renewable resource generation stock in Illinois." Questionable statement: "Proposal 3 will create 94,000 jobs." As previously reported by Truth Squad, the 94,000 figure comes from a study paid for by the Michigan Environmental Council, a Prop 3 proponent, done by researchers at Michigan State University. That study actually projects 94,000 "job years" -- a research term that means one full-time job for one year. Michigan Energy Michigan Jobs says that the terms "jobs" and "job years" are commonly interchanged. However, the 94,000 figure in the study does not mean Michigan will add a net of 94,000 new, ongoing jobs to its economy. Overall impression: The ad correctly quotes the July 6, 2012, Crain's story. A viewer's impression would turn on the interpretation of the word "similar." Is a constitutional requirement for renewable power "similar" to a statutory requirement for one? The ad's use of the IPA report is consistent. The report does say renewable energy prices were heading down and renewable energy was creating jobs in the state. The ad, however, does continue to repeat the "94,000 jobs" claim that is not so clear-cut. Foul or no foul: As with a previous ad, Truth Squad is calling a Technical foul on the jobs statement: "A typical viewer is likely to think of a 'job' being a 'job' – something that will last, not something that ends in a year. Equating the word 'job' with the economist term of 'job year' certainly 'deserves additional explanation.'" It looks like the Truth Squad is attempting to pick the fly dodo out of the pepper. Stipulating "94,000 jobs" instead of "94,000 job years" seems a pretty trivial complaint, since both stipulations represent a lot of jobs. Spending precious campaign dollars on attempting to explain the difference between "jobs" and "job years" in a 31 second ad seems like a huge waste of advertising time. Stipulating “94,000 jobs” instead of “94,000 job years” seems a pretty trivial complaint, since both stipulations represent a lot of jobs. This isn't a trivial complaint. If the average job lasts 16 years (about half a career's length), then the number of jobs, J = 94,000 / 16 = 5,875 jobs. Hence, the actual number of jobs will likely be much less than the advertised 94,000 (by at least an entire order of magnitude).